License. We grant you a non-exclusive nontransferable license to use the NeuroPetVet website and the services therein subject to the terms hereof for a period beginning on the date of acceptance of these Terms and Conditions and ending on the earlier of: (a) the date we notify you of our termination of these Terms and Conditions; or (b) the date you notify us of your termination of these Terms and Conditions. It is your responsibility to properly protect your login information, including your username and password, from use by third parties. Licenses for viewing any Continuing Education Program (“CE”) and listening to Podcasts will be subject to the terms of the applicable subscription or one-time purchase. Conduct. You agree: (a) to use the NeuroPetVet website and services and products therein only for lawful purposes and in compliance with all applicable state, federal, or international laws, regulations, or other government requirements; (b) not to transmit any material that encourages conduct that could constitute a violation of such laws, regulations or requirements; and (c) not to upload any file containing malware, or any file that infringes the intellectual property or other rights of any third party or that is inappropriate in any way. Trademarks and Copyrights. Unless otherwise noted, the materials and works contained on the NeuroPetVet website, including the NeuroPetVet trademarks and logos, are owned by NeuroPetVet with all rights reserved. No Reproduction or Resale. You are not authorized to use any intellectual property owned by NeuroPetVet for resale to any other person or entity. You may not modify, copy, distribute, transmit, display, perform, reproduce, publish, license, create derivative works from, transfer, or sell any intellectual property, information, software, products, or services obtained from the NeuroPetVet website. You may, however, stream or download, where specifically permitted, podcasts, videos and/or related materials from the NeuroPetVet website for your personal, educational, non-commercial use only, provided you keep intact all copyright, trademark, and other proprietary notices. No Unlawful, Prohibited, or Reckless Use. As a condition of your use of the NeuroPetVet Website and the services and products therein, you warrant to NeuroPetVet that you will not use the NeuroPetVet website for any purpose that is unlawful or prohibited by these Terms and Conditions. 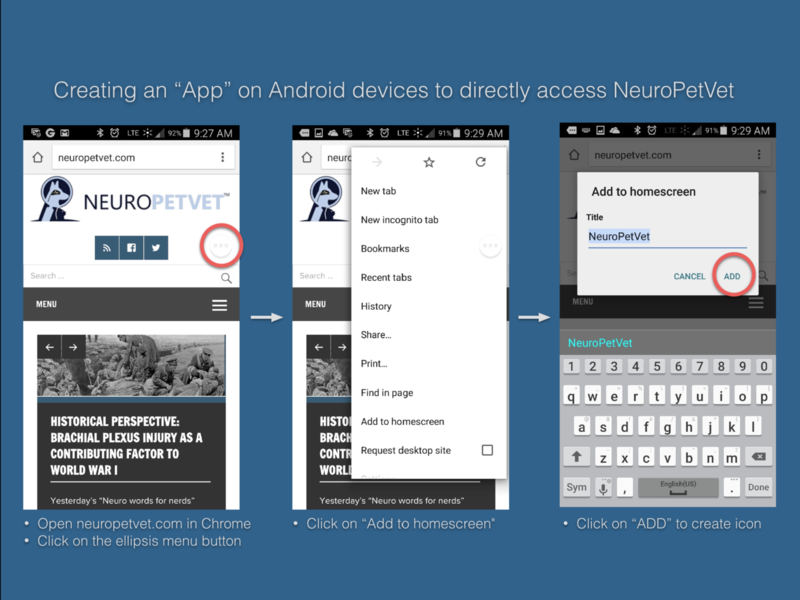 You may not use the NeuroPetVet website in any manner that could damage, disable, overburden, or impair the NeuroPetVet website or interfere with any other party’s use and enjoyment of the NeuroPetVet website. You may not use the NeuroPetVet website in any manner that could jeopardize your safety or the safety of others, including texting, streaming, e-mailing, or surfing the NeuroPetVet website while driving, running, or participating in other activities that require your attention to safety. If anyone brings a claim or threatened claim against NeuroPetVet arising out of your actions or use of the NeuroPetVet website or the services and products therein, or anyone else’s use thereof through your account, you agree to indemnify and hold NeuroPetVet, its parents, subsidiaries, affiliates, managers, officers, agents, independent contractors, and employees harmless from any claim or demand, including reasonable attorney’s fees and costs at arbitration, through trial or on appeal, in addition to all other sums provided by law. DISCLAIMER OF WARRANTIES. THE NEUROPETVET WEBSITE, INCLUDING ITS SERVICES AND PRODUCTS, ARE PROVIDED ON AN “AS IS” AND “AS AVAILABLE” BASIS AND WITHOUT ANY WARRANTIES, EXPRESS OR IMPLIED. 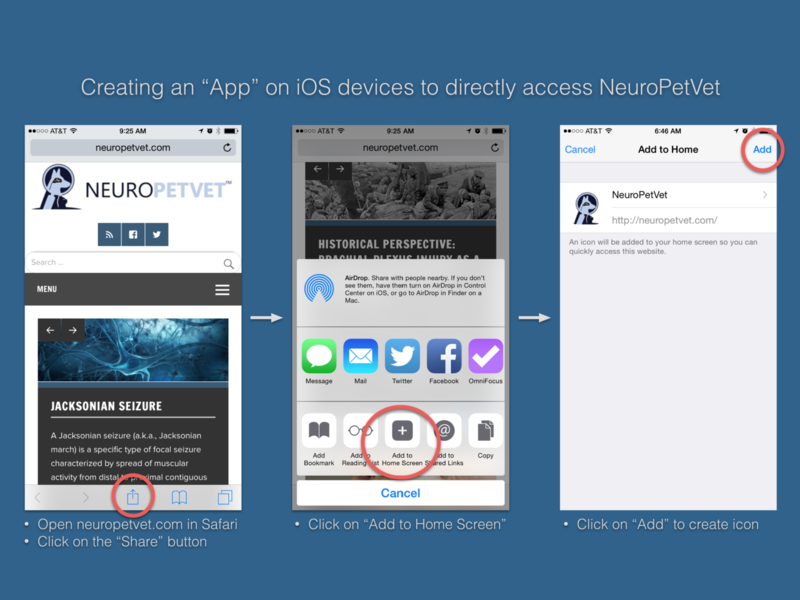 YOUR USE OF THE NEUROPETVET WEBSITE, INCLUDING ITS SERVICES AND PRODUCTS, IS AT YOUR OWN RISK. NEUROPETVET DISCLAIMS ALL WARRANTIES regarding the accuracy, safety, and/or completeness of the information contained IN THE NEUROPETVET WEBSITE. TO THE FULLEST EXTENT PERMITTED BY APPLICABLE LAW, NEUROPETVET DISCLAIMS ANY AND ALL REPRESENTATIONS AND WARRANTIES OF ANY KIND, EXPRESS OR IMPLIED, INCLUDING BUT NOT LIMITED TO THE IMPLIED WARRANTIES OF MERCHANTABILITY AND FITNESS FOR A PARTICULAR PURPOSE, AND NONINFRINGEMENT. WHILE WE TAKE REASONABLE PRECAUTIONS AGAINST INFECTION OF THE NEUROPETVET WEBSITE BY MALWARE, WE CANNOT GUARANTEE THERE WILL BE NO SUCH INFECTION. NOR CAN WE GUARANTEE THAT THE NEUROPETVET WEBSITE WILL BE PROVIDED IN A MANNER THAT IS UNINTERRUPTED, TIMELY, SECURE OR ERROR-FREE. SOME JURISDICTIONS DO NOT ALLOW THE EXCLUSION OF IMPLIED WARRANTIES; THEREFORE, THE ABOVE-REFERENCED EXCLUSION IS INAPPLICABLE IN SUCH JURISDICTIONS. The NEUROPETVET WEBSITE AND THE SERVICES AND PRODUCTS THEREIN are intended for THE EDUCATION OF veterinary professionals only and are not intended to be a substitute for professional veterinary advice, diagnosis, or treatment. These materials are intended to provide information for educational purposes only AND ARE THE EXPRESSES INTERPRETATIONS OF NEUROPETVET AND/OR ITS DIRECTORS, OFFICERS, MANAGERS, EMPLOYEES, INDEPENDENT CONTRACTORS, AND AGENTS. You should not rely on information from The NEUROPETVET WEBSITE AND THE SERVICES AND PRODUCTS THEREIN in place of PERFORMING YOUR OWN MEDICAL RESEARCH, VERIFYING ALL INFORMATION AGAINST VETERINARY LITERATURE, AND/OR seeking professional advice and assistance. YOU are responsible for confirming all medical information such as drug doses and medical accuracy against veterinary literature as needed. LIMITATION OF LIABILITY. WE DO NOT GUARANTEE THAT THE NEUROPETVET WEBSITE WILL ALWAYS BE SAFE, SECURE OR ERROR-FREE OR THAT THE NEUROPETVET WEBSITE WILL ALWAYS FUNCTION WITHOUT DISRUPTIONS, DELAYS OR IMPERFECTIONS. NEUROPETVET IS NOT RESPONSIBLE FOR THE ACTIONS, CONTENT, INFORMATION, OR DATA OF THIRD PARTIES, AND YOU RELEASE US, OUR DIRECTORS, OFFICERS, MANAGERS, EMPLOYEES, INDEPENDENT CONTRACTORS, AND AGENTS FROM ANY CLAIMS AND DAMAGES, WHETHER IN CONTRACT, TORT (INCLUDING NEGLIGENCE), KNOWN AND UNKNOWN, ARISING OUT OF OR IN ANY WAY CONNECTED WITH ANY CLAIM YOU HAVE AGAINST ANY SUCH THIRD PARTIES. IF YOU ARE A CALIFORNIA RESIDENT, YOU WAIVE CALIFORNIA CIVIL CODE §1542, WHICH SAYS: A GENERAL RELEASE DOES NOT EXTEND TO CLAIMS WHICH THE CREDITOR DOES NOT KNOW OR SUSPECT TO EXIST IN HIS FAVOR AT THE TIME OF EXECUTING THE RELEASE, WHICH IF KNOWN BY HIM MUST HAVE MATERIALLY AFFECTED HIS SETTLEMENT WITH THE DEBTOR. WE WILL NOT BE LIABLE TO YOU FOR ANY LOST PROFITS OR OTHER CONSEQUENTIAL, SPECIAL, INDIRECT, OR INCIDENTAL DAMAGES ARISING OUT OF OR IN CONNECTION WITH THESE TERMS AND CONDITIONS OR THE NEUROPETVET WEBSITE, EVEN IF WE HAVE BEEN ADVISED OF THE POSSIBILITY OF SUCH DAMAGES. YOU AGREE THAT OUR AGGREGATE LIABILITY ARISING OUT OF THESE TERMS AND CONDITIONS, THE NEUROPETVET WEBSITE AND YOUR USE OF IT, OR THE SERVICES AND PRODUCTS THEREIN WILL NOT EXCEED THE GREATER OF ONE HUNDRED DOLLARS ($100) OR THE AMOUNT YOU HAVE PAID US IN THE PAST TWELVE MONTHS. Any claims arising in connection with your use of the NEUROPETVET WEBSITE AND any Content THEREIN must be brought within one (1) year of the date of the event giving rise to such action occurred. APPLICABLE LAW MAY NOT ALLOW THE LIMITATION OR EXCLUSION OF LIABILITY OR INCIDENTAL OR CONSEQUENTIAL DAMAGES, SO THE ABOVE LIMITATION OR EXCLUSION MAY NOT APPLY TO YOU. IN SUCH CASES, NEUROPETVET’S LIABILITY WILL BE LIMITED TO THE FULLEST EXTENT PERMITTED BY APPLICABLE LAW. YOU ARE SOLELY RESPONSIBLE FOR ANY DAMAGE TO YOUR COMPUTER SYSTEM OR LOSS OF DATA RESULTING FROM YOUR USE OF THE NEUROPETVET WEBSITE AND ITS SERVICES AND PRODUCTS. Termination. NeuroPetVet may terminate your account, and remove and discard any of your content, at any time without notice, for any reason. We will not be liable to you or any third-party for any termination of your access to the NeuroPetVet website. You may also delete or disable your account at any time. Choice of Law and Exclusive Venue. You agree that all disputes arising under or related to your use or access of the NeuroPetVet website, the products and services offered therein, and these Terms and Conditions shall be brought solely in the federal and state courts situated in the County of Essex, State of Massachusetts. You consent to personal jurisdiction and venue in the federal and state courts situated in the County of Essex, State of Massachusetts. The validity, interpretation, construction, performance, enforcement, remedies, and the rights and obligations of the parties to the NeuroPetVet website, the products and services offered therein, and these Terms and Conditions, shall be governed and construed by the substantive laws of the State of Massachusetts (without regard to the conflict of laws rules or statutes of Massachusetts or any other jurisdiction that might result in the application of other law). Entire Agreement. These Terms and Conditions constitute the entire agreement between you and NeuroPetVet with respect to the subject matter herein and supersedes all prior oral and written agreements, promises, negotiations, commitments, representations, inducements, statements and communications. No oral representation and no prior or contemporaneous oral or written matters extrinsic to these Terms and Conditions shall have any force or effect as to the provisions of these Terms and Conditions. All prior and contemporaneous discussions concerning the subject matter of these Terms and Conditions have been merged and integrated into, and are superseded by, these Terms and Conditions. Modification. NeuroPetVet reserves the right, at any time, to modify the Terms and Conditions without prior notice to you. Modifications are effective immediately upon being posted on the NeuroPetVet website. Your continued use of the NeuroPetVet website and the services and products therein after any amendments are posted constitutes your acceptance of the modifications. Except as provided in this paragraph, these Terms and Conditions may not be amended except by agreement in writing signed by the party against whom enforcement of the amendment is sought. Amendment. We may amend these Terms and Conditions at any time by posting amendments on the NeuroPetVet website, and any such amendments will be binding on you after your acceptance of those amendments by continued use of the service. You will not be allowed to continue use of the service unless it accepts any such amendments. Waiver. NeuroPetVet’s failure to exercise or enforce any term in these Terms and Conditions will not constitute a waiver of such term. Attorney’s Fees. In the event that any action, suit or legal proceeding is initiated or brought to enforce any or all of the provisions of these Terms and Conditions, you agree that NeuroPetVet shall be entitled, in addition to any other remedies provided by law or equity, to collect from you, and you agree to pay NeuroPetVet its costs and expenses, including reasonable attorney’s fees, costs, disbursements, photocopy charges, witness fees, subpoena fees, expert witness fees, computerized legal research fees, computer forensics consulting fees, and all other expenses incurred by NeuroPetVet, including those on appeal and in connection with the enforcement or collection of any order, award, or judgment against you, to the extent that NeuroPetVet prevails (in whole or part) in such legal proceeding. Assignability. The rights, responsibilities, or obligations granted or assumed with respect to these Terms and Conditions and any subscription or CE purchased by you through the NeuroPetVet website may not be assigned by you, in whole or in part, without first obtaining NeuroPetVet’s written consent. Continuing Education Programs. All CE programs offered on the NeuroPetVet website are certified by the Registry of Approved Continuing Education (“RACE”). A certificate for completion of CE programs will be provided to you if you: (a) successfully complete an online quiz for each CE program (with a score of at least 70% correct); and (b) certify that you are the person who actually took the quiz. Verification of Medical Information and Course Qualification. It is your responsibility to verify that any CE course completed through the NeuroPetVet website qualifies for CE credit in your state. While we believe that the information contained in the NeuroPetVet website and any CE course offered through the NeuroPetVet website is accurate at the time it is posted to the NeuroPetVet website, there are frequently new scientific discoveries and changes to accepted veterinary practices. Likewise, the content is the expressed scientific and medical opinion of the speaker. It is your responsibility to verify that the information provided is still accurate and up-to-date. We make no guarantee that your use of the information or techniques contained in or demonstrated in any CE course offered through the NeuroPetVet website will be successful. Further, reviewing of CE program materials is not a substitute for all aspects of in-person training, where the trainer is able to evaluate your skills in using the techniques demonstrated. You are responsible for confirming all medical information such as drug doses and medical accuracy against veterinary literature as needed.